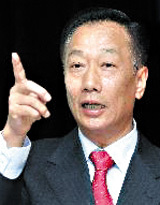 Taiwan's Hon Hai Precision Industry has vowed to beat Samsung in the LCD business by cooperating with Sharp, according to chairman Terry Gou. Hon Hai is the country's largest electronics components manufacturer and parent of China's Foxconn, which manufactures iPhones and other Apple products. At a press conference following a Hon Hai shareholders meeting in New Taipei on Monday, Gou said Sharp's cutting-edge technology is superior to Samsung's. He vowed to beat Samsung in three to five years. Gou's comments came as he was explaining plans to develop Sharp after Hon Hai and affiliates agreed in March to acquire a 9.9 percent stake in the Japanese firm for 67 billion yen. As of the end of last year, Sharp ranked fifth in the global LCD market, while Samsung Display was first. "We've confidence that after getting into these new technologies, within one to two years we'll quickly be successful" with Android, Windows and Apple iOS, Gou said according to Business Week. "The Sharp deal will help us to defeat Samsung." Gou apparently nurtures some personal animus against Samsung, which dates back from the time when Samsung testified against Taiwanese companies in an investigation by the European Commission on price-fixing in the flat panel industry. "I respect the Japanese and especially like their execution and communication styles," he said. "Unlike the Koreans, they will not hit you from behind." Hon Hai rose to prominence by making products for Apple and other global companies on consignment contracts via Foxconn in China's Guangdong and Chengdu. Foxconn employs more than 1.2 million workers, but has made headlines with a rising number of suicides among staff as a result of bad working conditions.